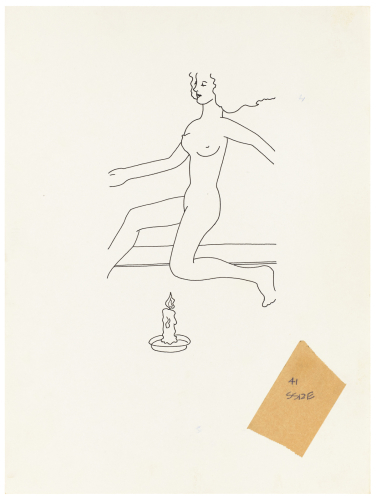 Mayo Thompson, Drawing for “Rangoon”, 1970, ink and pencil on paper, ballpoint pen on masking tape, 12 x 9". Mayo Thompson has spent more than forty years making music in and around the art world. He’s best known for producing over twenty albums with a panoply of artistic collaborators, usually under the name of his band, Red Krayola (formerly Red Crayola). But through the years, Thompson has purposefully eluded easy categorization as an artist—until very recently, when the art market noticed he has also long made compelling visual art. Thompson’s current show, titled “?,” presents an assortment of works on paper, including a series of illustrations, “Drawings for ‘Rangoon’,” which Thompson made for the 1970 book Rangoon (written by longtime bandmate Frederick Barthelme). These line drawings, laid out in vitrines, cannily and funnily exaggerate and rearrange visual tropes of comic-book Americana: a buxom woman in a tiny dress clasps a giant football; a naked lady hops over a burning candle. Another series, “Figure Study (Victorine),” from the 1980s, includes loosely sketched “character studies”—a hat and a guitar, for instance—from an opera called Victorine, on which Thompson has been working for several decades with the group Art & Language. Most difficult to summarize are his newest works, sixteen drawings all made this year that range from earnest landscape, wildlife, and architecture studies to a pair of “Political Cartoons” with motifs apparently abstracted from Communist propaganda posters. There’s no attempt to cohesively present this array of production under a curatorial slogan—we get only the titular question mark and an impenetrable press release about how unknowable Thompson is. The lack of forced coherence is a relief, though; the works don’t appear to be urgently selling themselves, and neither does the artist. Rather than a unified thesis, the exhibition is a living archive of decades of artistic experimentation (still) unconcerned with self-categorization.